Thought I’d post the last of my 1991 Introduction tout suite. May you find it tout sweet. My thanks to the wonderful Pat Loughrey for the uplifting ending. He’ll recognize it from the BBC Northern Ireland Radio programme on the Famine orphans he did with me in 1987. He may even remember that hot day we went to interview a descendant of the Devlin girls, Mrs Merrilyn Minter. My sincere and heartfelt thanks to her for sharing her family history. As before, I’ll add some notes and references a bit later. Meantime I’ll add a couple of pics and a verse of poetry for your be/a-musement. Is anyone having trouble making the text larger? From a poem by one of Ireland’s foremost poets writing in Irish, Louis de Paor. ag bruíon gan stad./So unburdened. Let’s fight all the time. 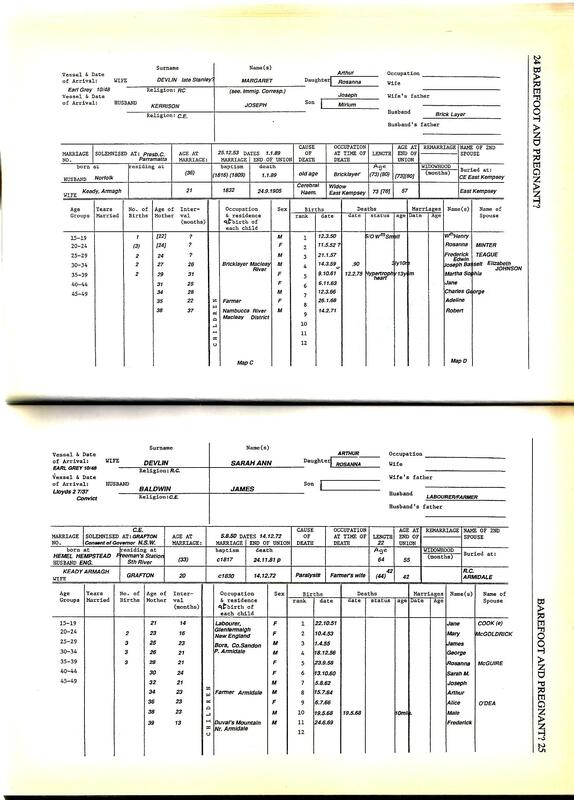 After 1857, SRNSW 4/4579, the Immigration Deposits Journals not only give the name of the depositor but also a full description of the person(s) for whose benefit remittance is being made. One even finds Remittance certificates among general Immigration Correspondence in the NSW State Archives, for example, SRNSW 9/6197, 4 August 1852, 16 year old Cathy Morgan of Enmore, per John Knox, deposited £8, nominating 39 year old Rose and 12 year old Jane Morgan presently in Kilkeel workhouse, County Down. This orphan was eager to bring her mother and sister to Australia! One would have to check shipping records to see if they actually came to Australia. It would be good to know if descendants of the orphans had searched these records; it would test the accuracy of my claim that these were exceptional cases. 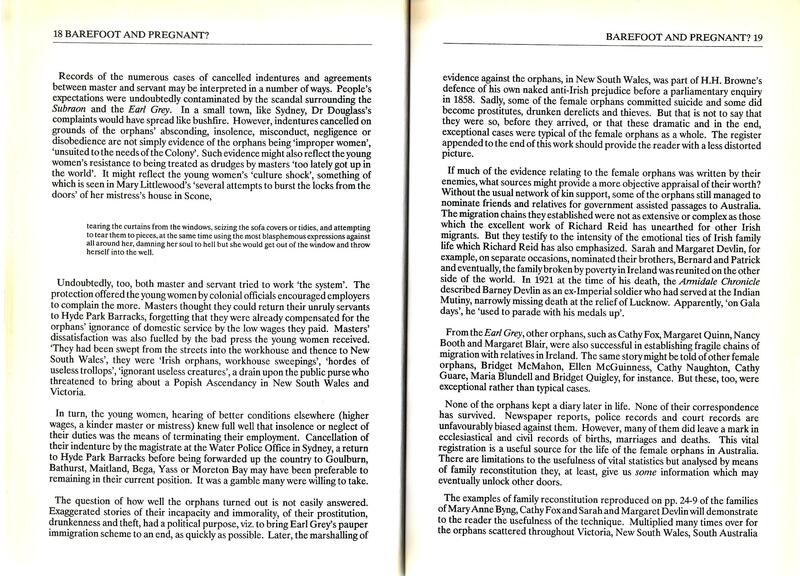 There is more information about the ‘gems’ a demographic study of the orphans uncovers in my introduction to volume two of Barefoot…? (2001/2). Here’s one extract. “Our ‘typical’ famine orphan, if such a person ever existed, was a teenage servant from Munster who was Roman Catholic and able to read. Both her parents were dead (almost a quarter of those who came to New South Wales had one parent still alive). She married when she was nineteen, within two and a half years of disembarking in the colony (two thirds of those traced, married in less than three years of their arrival) most likely to an Englishman, ten or eleven years her senior, and of different religion from her own…If she was lucky enough to escape the hazardous years of childbirth, her completed family size was nine children. 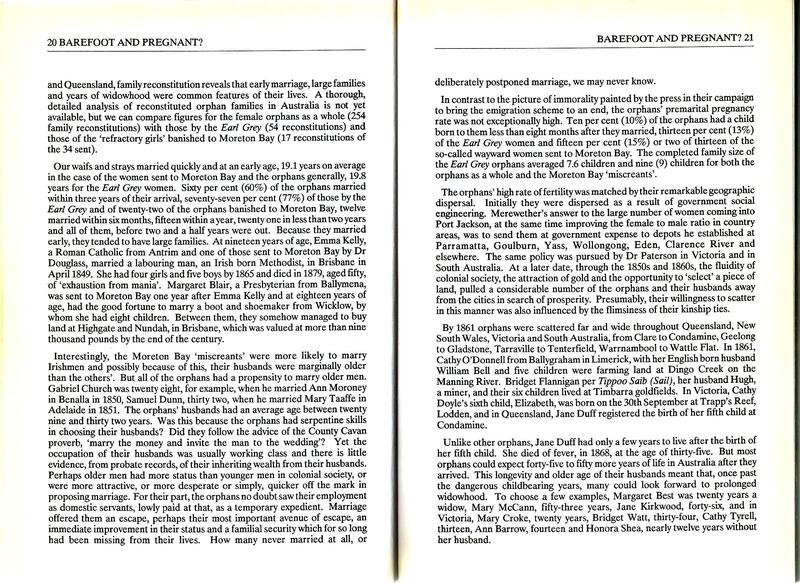 The famine orphans had a higher age-specific marital fertility rate than other Irish-born migrant women. 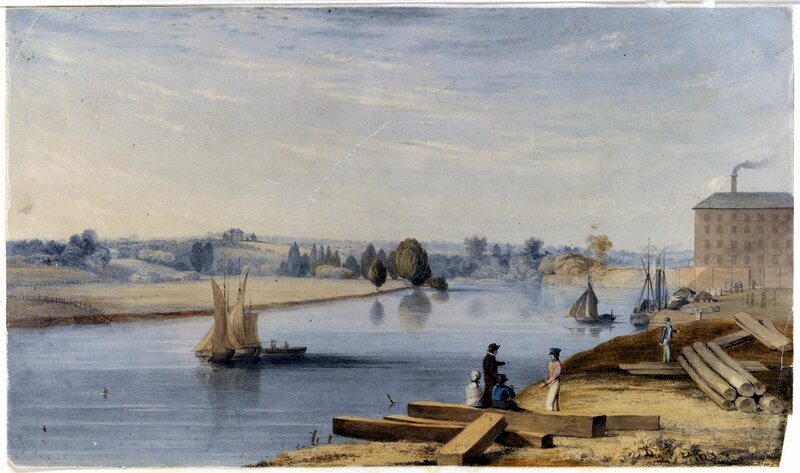 In New South Wales and Victoria our ‘typical’ orphan could expect to live another forty years, and in Queensland another fifty years after she arrived”. pp.3-4. Some readers may wish to measure their own orphan against this ‘typical’ one. Lots of other questions are worth asking; why did the orphans who went to Queensland live longer? Queensland orphans also appeared to have fared better, in the sense they had the highest proportion of estates valued at more than £1000. How many of the orphans married former convicts or ‘exiles’? Did any of them suffer domestic abuse? How many ended their final days in an institution of one kind or another? I’ve suggested the orphans life experience was as complex as the human condition itself. We need to be careful with the generalizations we make. 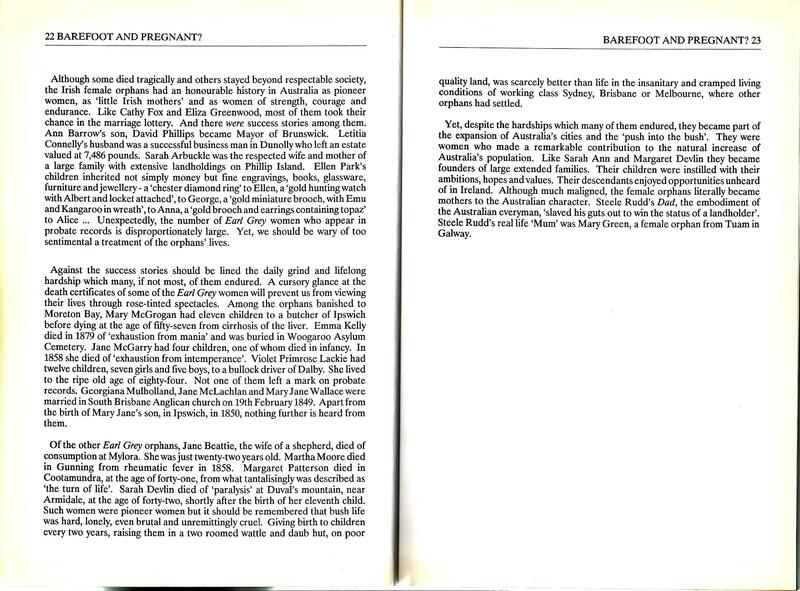 Have a look at my final sentence in the introduction to Barefoot vol.1 above. May I finish by drawing attention to the annual ‘gathering’ of orphan descendants, and others, at Hyde Park Barracks in Sydney on the final Sunday in August? 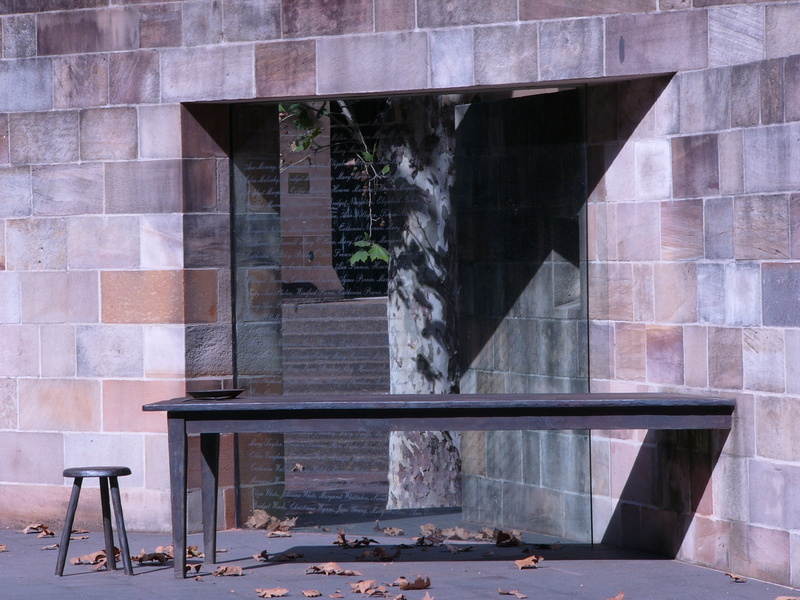 The Melbourne ‘mob’ meet in November in Williamstown, details later. This entry was tagged Ann Barrow, Armagh workhouse, Bridget Quigley, cancelled indentures, Cathy Guare, Cathy Morgan, Doireann Ní Ghríofa, Earl Grey, Earl Grey orphans, Immigration Agent H. H. Browne, Irish Famine orphans, Irish Famine orphans to Australia, Louis de Paor, Mary Littlewood, Nancy Booth, orphan's marrying, orphans scattering, orphans' fertility, orphans' widowhood, Paramatta 1847, Pat Loughrey, Sarah Devlin, Steele Rudd. Bookmark the permalink.